Vanilla Ice Cream - Do You Know The Muffin Man? Notes: In the many years since I bought my ice cream machine, I've never made plain vanilla until this weekend. The recipe I used is fairly standard, using eight yolks to a quart of cream; I've seen some using a dozen! My canister of vanilla sugar had exactly one cup of sugar left plus 4 “previously enjoyed” beans so I dumped all of that into the custard mixture along with the seeds of a fresh bean. As I had hoped, this ice cream was the best vanilla I've ever tasted: very rich, creamy, wonderful mouth feel with intense flavour. 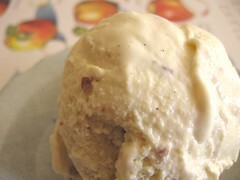 Pictured is the ice cream mixed with pecan praline (made with leftover garnish from this dinner party dessert). I also made maple walnut by mixing in syrup and crumbled deep-fried sweetened walnuts from TNT Supermarket).